Delaware-based Speedwerks were in an enviable position. 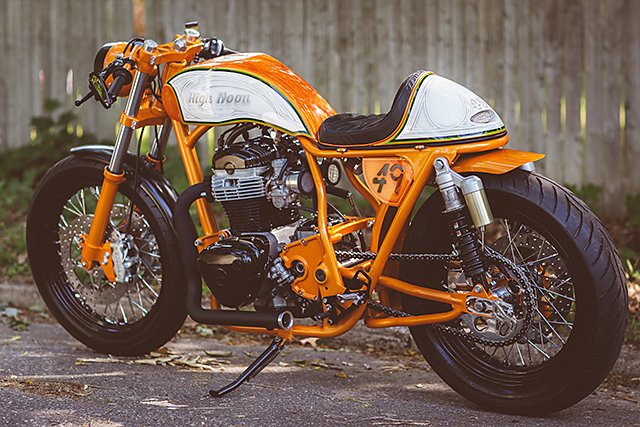 They’d been approached by a long-term customer wanting a balls-to-the-wall café racer that could be ridden hard and ridden every day. 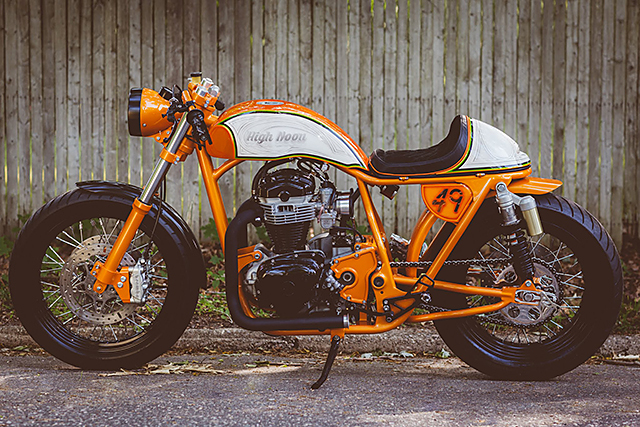 The customer, local racer and speed boat enthusiast known only as ‘Richie’, had seen a few Deus café racers and wanted something in a similar vein, but louder and better engineered than anything that had come before. 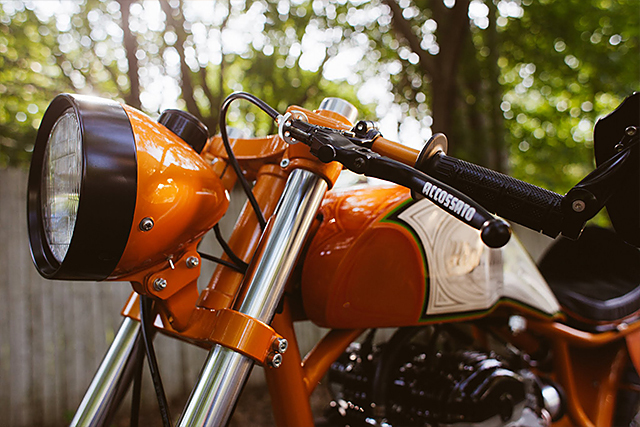 Armed with only a Kawasaki W650 engine stripped of its electric start, Speedwerks surveyed the line-up of modern retro motorcycles for a donor frame and found few that could blend traditional looks with modern geometry and stiffness. So they went about designing one. On the back of a beer-soaked napkin at a local sports bar. And Marc has the resume to back it up. He’s won Monster Garage and built frames for Aerosmith’s cruiser company Dirico. “If you can imagine it, Marc and Budweiser can make it.” The knowledge that Marc brought to the build, and to the workshop, can’t be underestimated. “I’ve never learned more from one person in my life and unfortunately, his kind are a dying breed”, Steve says. 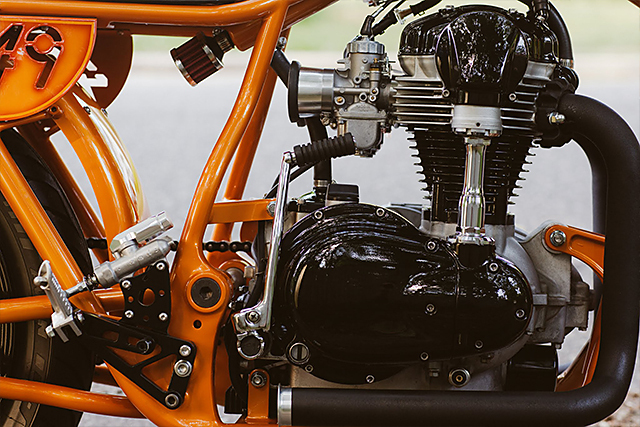 For a blueprint sketched on the back of a serviette over a few drinks, Marc did a remarkable job creating the tight, stiff frame that pins the W650 engine firmly in place. And its slick lines aren’t just for looks, with the backbone also doubling as a crankcase catch and vent and also a hiding place for clutch cables and the wiring loom, which feed into an Ignitech programmable ignition and lithium-ion battery. The genius of the design doesn’t end there, with the rear fender able to slide in and out of the frame to hold the licence plate. Those two years certainly didn’t go to waste. 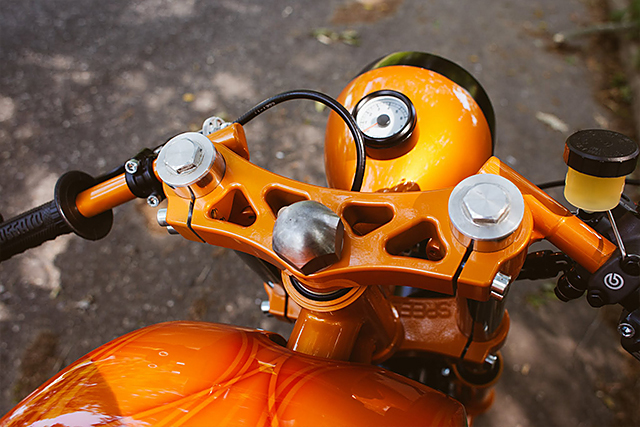 And all that careful work on the frame is matched by a no-compromise approach to the suspension, which carefully marries modern stopping power with traditional lines. Up front a pair of conventional 41mm Yamaha forks were shaved down and Race Tech springs and emulators mounted inside. 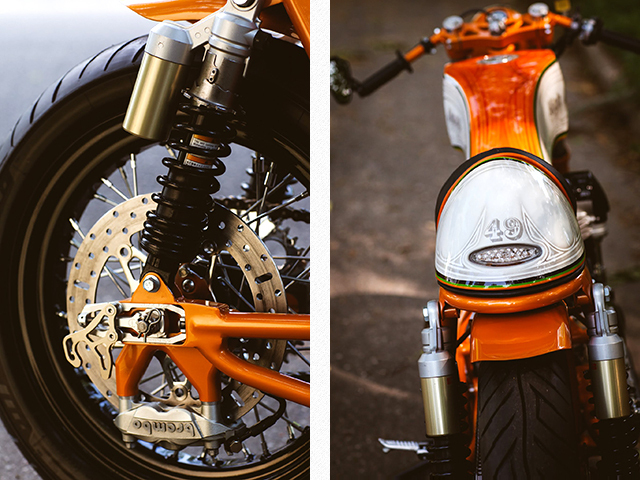 Speedwerks designed billet radial mounts for Brembo monoblock calipers, so it would have the look of a conventional fork with the stopping power of an improved inverted radial mount. 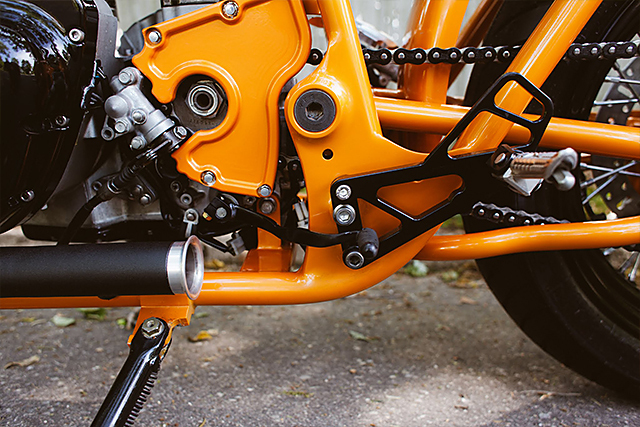 The rear runs a matching brake setup while a pair of Kawasaki ZRX1200R shocks, shortened, re-valved and re-sprung, help keep the tail end of the bike in line. 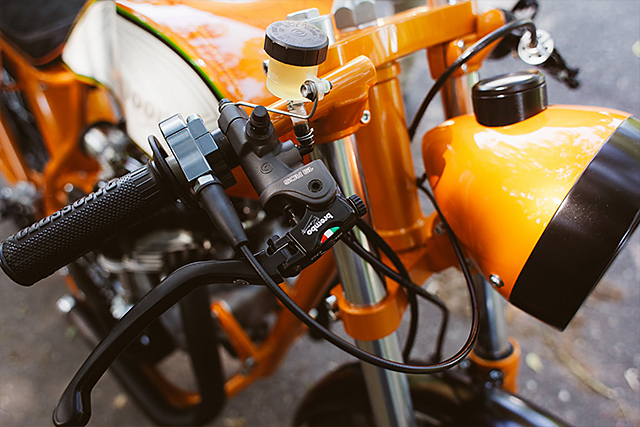 Just about everything else you see on the bike was designed and manufactured in-house. 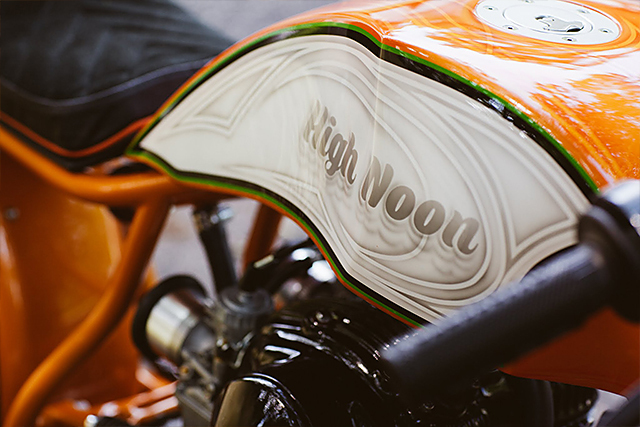 The chrome-moly swingarm is also their own creation and the arched steel tank, close-hugging front fender and alloy seat pan were all sketched out and manufactured by the capable team. The level of fabrication doesn’t end there – look closer and you’ll see that all the ancillary parts were also designed by the guys at Speedwerks, including the triple trees, brake hangers and motor mounts which were all CNC’d from billet aluminium. Despite the ostentatious 70’s-inspired paint scheme completed by John Walls the bike still manages to show an appreciation for the finer touches in a build – and helps me realize how little I know about bike building, fabrication and the black art of frame design. 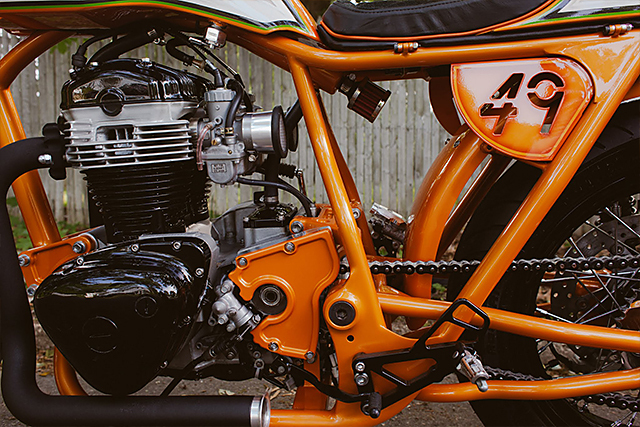 Starting with only an engine, the workshop have managed to create a unique, functional motorcycle held together by a chrome-moly piece of automotive, beer-fuelled genius. Makes you want to drink more, doesn’t it?